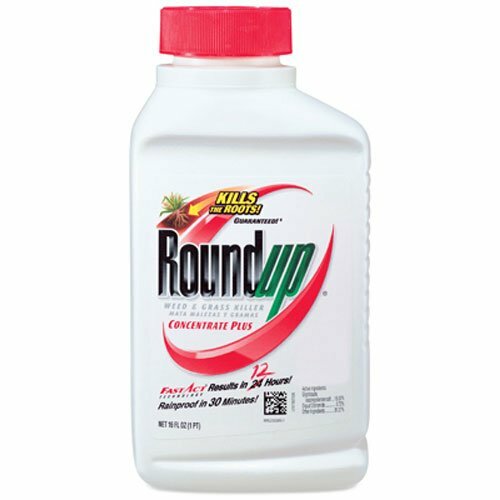 The economical, effective way to handle larger areas, Roundup Concentrates are simple to prepare and use, and they deliver all the weed-control power you expect from the Roundup brand. Roundup Weed & Grass Killer Concentrate Plus is perfect for use around flowers, shrubs and trees, on patios, walkways, driveways, gravel areas and mulch beds, and along fences, edging and foundations (not for use around existing edibles). It is also effective on large areas such as lawn replacements or garden plot preparation. For best results, add 6 fl. oz. of concentrate to one gallon of water in a Roundup Brand Premium Sprayer! The formula is rainproof in 30 minutes, and with FastAct Technology, you will see visible results in 12 hours. View More In Weed & Moss Control. If you have any questions about this product by Roundup, contact us by completing and submitting the form below. If you are looking for a specif part number, please include it with your message.